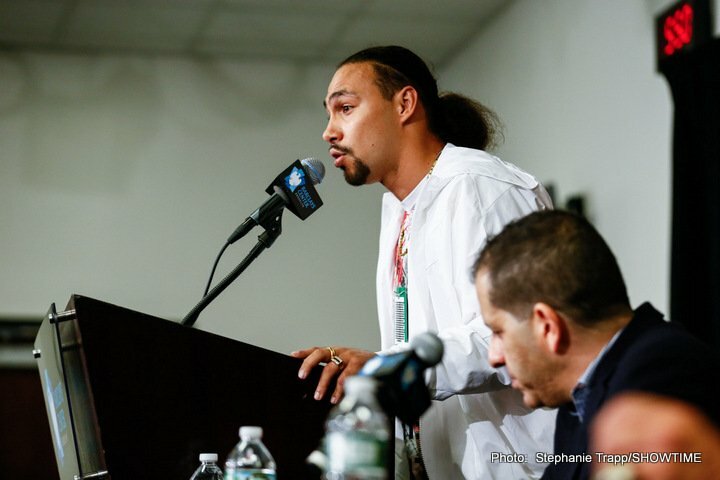 By Dan Ambrose: Welterweight champion Keith “One Time” Thurman (28-0, 22 KOs) has a message to send to the other top fighters in the 147-lb. division in letting them know that he’ll soon by coming for them. Thurman, 28, is coming off of an elbow injury that has sidelined him since his narrow 12 round split decision win over Danny Garcia on March 4th. That was a costly one for Thurman, because he hurt his elbow blocking Garcia’s powerful punches. Each time Garcia would throw a shot, they would knock Thurman’s elbow backwards and that would cause him pain. The injury has been repaired through surgery, but Thurman is still feeling pain in his elbow. He’s counting on the pain to go away in the next 6 weeks with the rehab he’s going to be doing on it. After that, Thurman and his manager Al Haymon will be picking out an opponent for his next fight in February or March. Thurman is turning out to be a fragile fighter now that he’s nearing 30, and it’s quite possible that it could impact his career if the injuries continue at this rate. Only the strong can be champions. If you get a lion losing teeth and claws, like Thurman, he’s not going to be able to fend off the other lions. There’s already boxing fans wondering when the WBA and WBC will get around to stripping Thurman of his titles so that a healthy fighter can defend them. “In 6 weeks from now, we’ll start taking some names,” said Thurman to Fighthype.com about his comeback fight in February or March. Thurman had this message to give to the other top welterweights in the division: “I know you guys been talking about me, and when I get in the ring, you can see about me. So that’s all I got to say about that,” said Thurman. Thurman isn’t healthy enough for him to be talking as boldly as he is. Thurman’s messages to the other top dogs in the 147-lb. division would be taken seriously if he wasn’t a once-a-year fighter like he is now, holding onto the belts and seemingly keeping them hostage. Thurman is sitting on the WBA/WBC belts, and rarely defending them. Even when Thurman does defend his titles, he picks out certain fighters that are beatable rather than the fighter the boxing fans want to see him fight in Errol Spence Jr. Instead of Thurman taking that fight against Spence, he fights Danny Garcia and Shawn Porter. The other top fighters in the welterweight division sense weakness in Thurman with his body breaking down on him repeatedly. Thurman’s injury problems have limited his activity in the last 2 years of his boxing career, causing him to fight just once in 2016 and once in 2017. Thurman surprised a lot of boxing fans and fighters recently when he pronounced that he would be fighting 3 times in 2018. It was hard for the fans and fighters to take Thurman seriously, because he’s been suffering injuries as far back as 2014. Back then, Thurman was dealing with a shoulder injury. In 2016, it was neck injuries, and in 2017, it’s an elbow injury. You get the picture. Thurman is a good fighter, but he cannot stay healthy for any length of time. He’s become fragile. “I can do some light work, but we’re not popping the punch out,” said Thurman about his surgically repaired elbow. ”When I do pull the punch out at full extension, even now there’s soreness. We were shooting for mid-February or the first week of March. I feel good and I feel like I’m going to bounce back, and I hope I do,” said Thurman. It doesn’t sound good with the way Thurman is talking about his elbow injury. Hopefully Thurman can recover from elbow injury and fight without pain, but you never know if it’s going to heal or not. If this becomes a chronic problem for Thurman, he’ll either need to fight through the pain like most boxers do or retire from boxing. Thurman is not going to be able to sit on his titles and rarely fight due to his injury problems. The sanctioning bodies will put up with Thurman’s injury problems for a while, but at some point, they’ll look to make him an Emeritus champion and have some healthy fighters scrap for his titles. “At least one,” said Thurman about wanting one tune-up fight in February or March before he faces the good opposition. “I fought Shawn [Porter] and then I fought Danny [Garcia]. I didn’t take nothing in between. I’m coming off of surgery. For the fans to demand something right now is a little unrealistic. I just want to get back. I’m in my prime. I want to get the dust off in my comeback fight, and then start competing with the big dogs in the welterweight division,” said Thurman. Thurman sounds like he’s not happy with the boxing public expecting things from him. Thurman says it’s unrealistic for the fans to demand that he fight top guys. Well, I hate to break the news to Thurman, but he’s a world champion now. The champions are expected to fight the best in their divisions instead of milking their titles and fighting only once a year. Thurman has a lot of talent, but he’s not fighting often enough for the fans, and he’s fighting the wrong guys. Thurman is dragging out his fight with Spence in the same way that Floyd Mayweather Jr. dragged out his fight against Manny Pacquiao. The thing is, Thurman isn’t as talented as Mayweather, and he’s not been able to stay healthy like him. Thurman hasn’t faced very many good fighters as it is during his career, so it’s not as if can afford to take tune-up level fighters. Thurman has only fought 2 good fighters during his 10-year pro career in Danny Garcia and Shawn Porter. Only Porter stands out. Garcia has a lot of flaws, and he’s only been tested once in his career in his fight with Lucas Matthysse in 2013. Porter is the only name that stands out on Thurman’s resume. Thurman isn’t healthy enough or good enough for him to stall on the Spence fight. Thurman needs to take that fight now before he ends up losing to the likes of Porter or Garcia in rematches. Thurman barely beat those guys. With Thurman’s injury problems, he may run out of look and get beaten by one of those fighters when the time comes for him to fight next year against one or both. If Thurman suffers an injury in his tune-up fight in early 2018, then you can forget about him taking his rematches with Porter and Garcia next year like he wants.